[First published February, 2006] Kenneth Sikorski has tested whether democracies are the least corrupt compared to other forms of government. He showed they are, using Transparency International’s 2005 Corruption Perceptions Index (CPI). Transparency International has just released its Global Corruption Report 2006, which includes Chapter 10 on “Ten years of the CPI: determining trends,” by Johann Graf Lambsdorff. Their global index for previous years is here. Overall, our findings indicate that significant improvements between 1995 and 2004 occurred (in descending order of significance) in Estonia, Spain, Italy, Bulgaria, Mexico, Hong Kong, Colombia, Costa Rica, Taiwan, Australia, Iceland and Russia. Deterioration, on the other hand, was significant in Argentina, Ireland, Poland, Czech Republic, Zimbabwe, United Kingdom, Ecuador, Indonesia, Turkey, Canada, and the Philippines. In a following chapter, “Governance matters IV: new data, new challenges,” Lambsdorff discusses governance indicators covering 209 countries for 2004. These indicators are based on 352 different underlying variables measuring perceptions of a wide range of governance issues. The variables are drawn from 32 separate data sources constructed by 30 different organizations worldwide. For those of you interested in global performance and the effect of freedom, this report and those discussed and linked below are a bonanza. that there is a strong causal impact of institutional quality on per capita incomes worldwide. Figure 12.1 [shown below]shows a representative set of estimates of this “development dividend” of good governance. These estimates suggest that a realistic one-standard deviation improvement in governance would raise incomes in the long run by about two- to-threefold. Of course, there is variation around these relationships, since governance is not the only thing that matters for development – but it certainly is a very important factor deserving policy-makers’ attention. 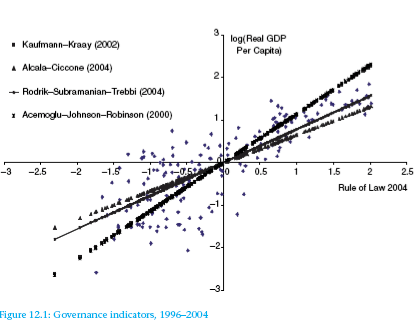 The rule of law, as measured on the X axis, is a major indicator of democracy, and as shown is closely related to a countrie’s wealth — its GDP per capita. Note that this is logged, which means that the wealth of countries curves sharply upward with the presence of the rule of law. In general, the patterns documented in the data for US states reveal the same basic relationships that have been found using international evidence. This similarity is particularly interesting given that, here, corruption is measured using federal conviction data rather than the type of opinion survey that is the norm in the cross-country literature. In sum, Wolfowitz’s World Bank presidency, which had seemed to lack an organizing theme, has acquired one. The new boss is going to be tough on corruption, and he’s going to push this campaign beyond the confines of the World Bank; [and he has] persuaded the heads of several regional development banks to join his anti-corruption effort. RJR: The empirical results mentioned above and in the links below provide strong support for Wolfowitz’s campaign. We undertake to identify general determinants of the pattern of legal and illegal corruption worldwide . . .
RJR: One of the things that the study found is “that fundamental accountability may [play] a clear role in development. This may be a key variable in the determination of corruption in richer societies — policies oriented to its reinforcement may be very fruitful.” What is most important about this is the way accountability was measured — the freedom of the press. This is also a cental indicator of democratic freedom. A number of popular notions and outright myths on governance and corruption are addressed in this chapter. We distinguish clearly between governance and anti-corruption, while probing the links between both notions. In so doing we challenge the conventional definition of corruption as being too narrow, legalistic and unduly focused on the public sector, while underplaying the role of the private sector. We suggest that the undue emphasis on narrow legalism has obscured more subtle yet costly manifestations of misgovernance, which afflict rich countries as well….Further, we find that governance constraints, and corruption in particular, is a key determinant of a country’s global competitiveness. These findings challenge traditional notions of what constitutes the country’s ‘investment climate’, and who shapes it. It is also found that illegal forms of corruption continue to be prevalent in the interaction between transnationals of the rich world and the public sectors in many emerging countries. Finally, we suggest an empirical link between governance and security issues.